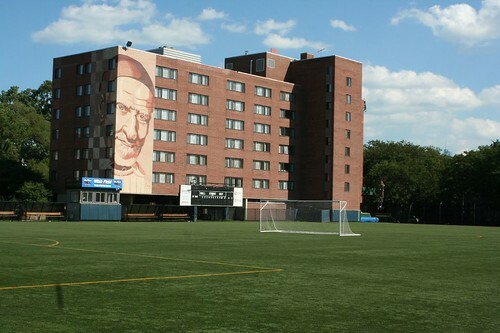 This giant mural of St. Vincent adorns the west face of DePaul University’s Francis X. McCabe Hall. It can’t be missed if you’re riding north on the Red Line. 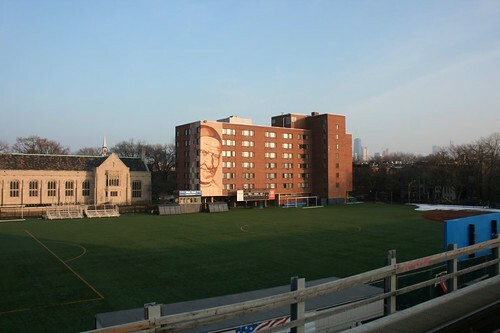 The mural, titled We Are DePaul 2, was created in 2001 via a composite of 16 repeated images of DePaul students and faculty. But it’s not the composition or technical aspects that intrigue me so. No, it’s his chagrinned scowl. This entry was posted in Murals, Wall Art and Graffiti. Bookmark the permalink. I've always seen it as a benevolent smile, not a scowl at all. Anyway, it's fun to hear tourists on weekends as St. Vincent comes into view: "Look! There's the Pope!" Except for the cap, he looks like Redd Foxx in his "Sanford and Son" role.